Learn how to do Online digital marketing from basic level to expert level which is taught by hands-on experience working professionals. With our Digital Marketing Training in Chennai, you will not only learn concepts of it and you will able to create digital marketing campaign for any business, products, services, software’s and websites from small sizes to big. Get enrolled for the most demanding skill in the world. Digital Marketing Training in Chennai will make your career a new height. We at Besant technologies provide you an excellent platform to learn and explore the subject from industry experts. We help students to dream high and achieve it. Besant Technologies provides flexible timings to all our students. Here are the Digital Marketing Training in Chennai Schedule in our branches. If this schedule doesn’t match please let us know. We will try to arrange appropriate timings based on your flexible timings. Digital marketing is promoting business, products or services through online channels. This promoting can be done through organic and paid mainly on the internet and also on mobile phones. Nowadays, people spending most of their time on the internet and on their mobile phones. So our Digital Marketing Training Course should also focus on internet and on mobile phones to reach the right audience. Digital marketing is a key term for marketing of products or services in this digital world. What did we do at Besant Technologies for Digital Marketing Training in Chennai? In Besant Technologies this digital marketing technique with best trainers available in the industry who have real-time working experience in all kind of digital marketing techniques from organic to paid. So you will get trained in most popular search engine, social and email channels across the internet. To Whom Digital Marketing Training is suitable for? Digital Marketing Training in Chennai is suitable for all marketing professionals, students, a part-time job seeker who looks forward to becoming a digital marketer in future and become the online digital industry expert on the same. There is no technical skill required and no programming knowledge required to pursue this course. We at Besant technologies customized the syllabus covered according to the role requirements in the industry. We train experienced as well as fresher’s with the different separate module. Enter into E-commerce or IT/Software Industry with Good Salary. We make you Experts to manage marketing activities by yourself. the job market is booming and brands are putting more of a focus on digital marketing than ever before. Make the shift from Offline marketing to Online Promotions. Get Paid More Than Your Peers, digital salaries are rising faster in 2016 than in the previous five years. Digital marketing is in booming in the marketing right now and there are many job opportunities waiting to be grabbed in the digital industry. We can see foreign outsourcing also booming in India for the digital marketing. Get Job Ready in 6 Weeks | 6 Certifications | 4 Projects. 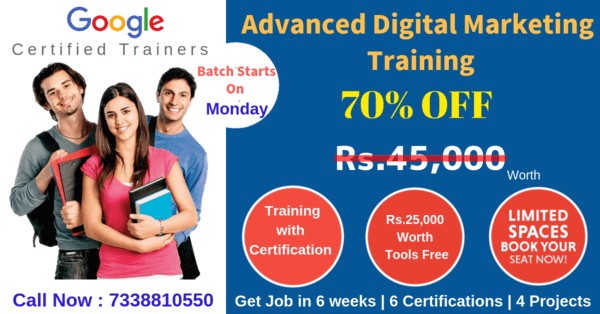 We help the trainees to get Google certification and also provide guidance to get placed in a digital marketing job in High paying industry. Besant Technologies, recognized as the Best Digital Marketing training institute in Chennai, has training modules for beginners, intermediates, and experts. Whether you are a student, Working professional or a project Head; the best Digital Marketing training institute in Chennai Provides best Digital Marketing training environment, Experienced Digital Marketing trainers, and flexible Digital Marketing training schedules for all Students. We are the best training institute for Digital Marketing training in Chennai with perfect range and best value for your fee. Digital Marketing course in Chennai fee structure can be afforded by all students coming from different batches ground. After Digital Marketing course in Chennai, learning the interview preparation becomes mandatory. Along with Digital Marketing classes in Chennai, we have sessions for the interview and resume preparation. At our Digital Marketing training center in Chennai, Placement team schedules recruitment drives for the students who are completed Digital Marketing course. Digital Marketing training in Chennai with placement assistance is the main feature which rated us five stars in the reviews by our alumni. Reviews and honest feedback is mentioned on our Reviews and Testimonials page. Besant Technologies is one of the best Digital Marketing training centers in Chennai delivering out-of-box thinking professionals to the IT industry. Besant Technologies has a modern lab equipped with all latest facilities, Students will have hands-on Training through live projects. These type of Digital Marketing training in Chennai will boost the confidence level of Students to face the real-time challenges successfully in a job. The Digital Marketing Training in Chennai syllabus includes Digital Marketing course module on real-time projects along with placement assistance. Digital Marketing topics covered are Introduction to Digital Marketing, basics digital marketing, analysis, keyword research, search engine optimization (SEO), On page optimization, Off page optimization, SEO updates and analysis, local business & google mapping, google AdWords or pay per click marketing, social media optimization (SMO), social media marketing (SMM), google web analytics, webmaster tools, creating a new simple website & Many more. Check the duration, course content, and syllabus given below. More than 7+ Years of experience in Digital Marketing ® Technologies. Trainers are expert level and fully up-to-date in the subjects they teach because they continue to spend time working on real-world industry applications. Trainers have Experienced on multiple real-time Digital Marketing projects in their Industries. Trained more than 2000+ Students in a year. Are certified Professionals with High Grade. Besant Technologies is the Legend in offering placement to the students. It has a dedicated placement Portal which caters to the needs of the students during placements. Trainers help the students in the development of their RESUME as per current industry standards. Besant Technologies conducts Development sessions including Mock Interviews, Presentation skills to prepare students to face challenging interview situation with ease. Besant Technologies has prepared its students to get placed in top IT Sectors like HCL, TCS, Infosys, Wipro, Accenture and many more. More than 2000+ students Placed in Last Year. Please Visit our Placed Students List on our website. How did Internet Marketing work? How Did Search Engine work? Besant Technologies Digital Marketing Training in Chennai Reviews have given by our students already completed the Digital Marketing training with us. Please give your feedback as well if you are a student. The most popular locations where students/professionals are lining up to get trained with us.